Did You “Hear” About the Underwater Acoustical Courses at ATI? Maybe Being “Underwater” is a Good Thing? Since 1984, the Applied Technology Institute (ATI) has provided leading-edge public courses and onsite technical training. Whether you are a busy engineer, a technical expert or a project manager, you can enhance your understanding of complex acoustical systems in a short time. Why not take a short course? ATI short courses are less than a week long and are designed to help you keep your professional knowledge up-to-date. Our courses provide a practical overview of acoustical technologies which provide a strong foundation for understanding the issues that must be confronted in the use, design and development of such complex systems. The three courses below present the fundamentals of underwater acoustic analysis and modeling, which deals with the translation of our physical understanding of sound in the sea into mathematical formulas solvable by computers. The courses provide a comprehensive treatment of all types of underwater acoustic models including environmental, propagation, noise, reverberation and sonar performance models. This four-day course is based upon the text Underwater Acoustic System Analysis by William Burdic. The course presents the fundamentals of underwater acoustics, acoustic signal generation and acoustic signal processing in sufficient depth to permit the analysis and optimization of the performance of underwater systems. The sonar systems include a variety of applications including active and passive detection of surface and sub-surface targets, acoustic communications, acoustic intercept and underwater depth sounders. The course will stress the required skills and techniques for system analysis and performance prediction. • Introduction to Sonar Analysis: Historical overview; important acoustical properties and characteristics; Acoustical Waves; Reflections and Refraction in the Ocean; Units and db. • Sound Propagation In The Ocean: Sound Speed Variation in the ocean with variation in temperature, depth, salinity; Geographic Variation; Acoustic bottom and surface losses; absorption losses; Typical propagation modes; surface layer; shallow channels; deep channels; convergence zones; RAP; Typical Propagation Curves. • Ambient Noise in the Ocean: Sources of noise; shipping; wind generated; thermal; others; Noise spectra; ambient noise angular distribution and correlation properties; use of the spatial correlation function in system calculations. • Target Characteristics: Passive signature sources including propulsion, propeller, auxiliary machinery, flow-induced noise; effect of self-generated noise on sonar performance; Target strength for mono-static and bi-static sonars; Reverberation from volume, surface and bottom. • Acoustic Transducers: Definitions, piezo-ceramic properties; Hydrophone configurations; equivalent circuits and sensitivity; Projector configurations, equivalent circuits, efficiency and operation. • Beamforming-Spatial Filtering: Purpose and types of beamforming; spatial filters, multi-element arrays, array shading functions; beam steering; gain of arrays in distributed noise; angle estimation. • Performance Analysis-Statistical Basis: Hypothesis testing and optimum detection processors for active and passive systems; ROC curves; Estimation of time delay, frequency and bearing. 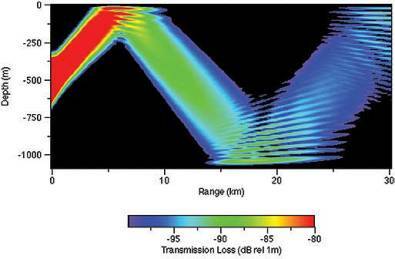 • Performance Analysis: Practical examples; Examples illustrating the analysis of sonar systems; passive narrowband and broadband detection; passive angle tracking and ranging; High-power system detection for multipath reverberation and noise-limited conditions with Doppler Processing. William Burdic received his BS and MS at Oregon State University. He served as an instructor in the Department of Electrical Engineering, Oregon State University when he joined Rockwell International. He has been engaged in the analysis and design of advanced radar and sonar systems. He is the author of two books “Radar Signal Analysis” and “Underwater Acoustic System Analysis”. James W. Jenkins joined the Johns Hopkins University Applied Physics Laboratory in 1970 and has worked in ASW and sonar systems analysis. He has worked with system studies and at-sea testing with passive and active systems. He is currently a senior physicist investigating improved signal processing systems, APB, own-ship monitoring, and SSBN sonar. He has taught sonar and continuing education courses since 1977 and is the Director of the Applied Technology Institute (ATI). This two-day course explains how to translate our physical understanding of sound in the sea into mathematical formulas solvable by computers. It provides a comprehensive treatment of all types of underwater acoustic models including environmental, propagation, noise, reverberation and sonar performance models. Specific examples of each type of model are discussed to illustrate model formulations, assumptions and algorithm efficiency. Guidelines for selecting and using available propagation, noise and reverberation models are highlighted. Demonstrations illustrate the proper execution and interpretation of PC-based sonar models. Each student will receive a copy of Underwater Acoustic Modeling and Simulation by Paul C. Etter, in addition to a complete set of lecture notes. Paul C. Etter has worked in the fields of ocean-atmosphere physics and environmental acoustics for the past thirty-five years supporting federal and state agencies, academia and private industry. He received his BS degree in Physics and his MS degree in Oceanography at Texas A&M University. Mr. Etter served on active duty in the U.S. Navy as an Anti-Submarine Warfare (ASW) Officer aboard frigates. He is the author or co-author of more than 180 technical reports and professional papers addressing environmental measurement technology, underwater acoustics and physical oceanography. Mr. Etter is the author of the textbook Underwater Acoustic Modeling and Simulation (3rd edition). • Introduction. Nature of acoustical measurements and prediction. Modern developments in physical and mathematical modeling. Diagnostic versus prognostic applications. Latest developments in inverse-acoustic sensing of the oceans. • The Ocean as an Acoustic Medium. Distribution of physical and chemical properties in the oceans. Sound-speed calculation, measurement and distribution. Surface and bottom boundary conditions. Effects of circulation patterns, fronts, eddies and fine-scale features on acoustics. Biological effects. • Propagation. Basic concepts, boundary interactions, attenuation and absorption. Ducting phenomena including surface ducts, sound channels, convergence zones, shallow-water ducts and Arctic half-channels. Theoretical basis for propagation modeling. Frequency-domain wave equation formulations including ray theory, normal mode, multipath expansion, fast field (wavenumber integration) and parabolic approximation techniques. Model summary tables. Data support requirements. Specific examples. • Noise. Noise sources and spectra. Depth dependence and directionality. Slope-conversion effects. Theoretical basis for noise modeling. Ambient noise and beam-noise statistics models. Pathological features arising from inappropriate assumptions. Model summary tables. Data support requirements. Specific examples. • Reverberation. Volume and boundary scattering. Shallow-water and under-ice reverberation features. Theoretical basis for reverberation modeling. Cell scattering and point scattering techniques. Bistatic reverberation formulations and operational restrictions. Model summary tables. Data support requirements. Specific examples. • Sonar Performance Models. Sonar equations. Monostatic and bistatic geometries. Model operating systems. Model summary tables. Data support requirements. Sources of oceanographic and acoustic data. Specific examples. • Simulation. Review of simulation theory including advanced methodologies and infrastructure tools. • Demonstrations. Guided demonstrations illustrate proper execution and interpretation of PC-based monostatic and bistatic sonar models. The subject of underwater acoustic modeling deals with the translation of our physical understanding of sound in the sea into mathematical formulas solvable by computers. This course provides a comprehensive treatment of all types of underwater acoustic models including environmental, propagation, noise, reverberation and sonar performance models. Specific examples of each type of model are discussed to illustrate model formulations, assumptions and algorithm efficiency. Guidelines for selecting and using available propagation, noise and reverberation models are highlighted. Problem sessions allow students to exercise PC-based propagation and active sonar models. Each student will receive a copy of Underwater Acoustic Modeling and Simulation by Paul C. Etter (a $250 value) in addition to a complete set of lecture notes. Paul C. Etter has worked in the fields of ocean-atmosphere physics and environmental acoustics for the past thirty years supporting federal and state agencies, academia and private industry. He received his BS degree in Physics and his MS degree in Oceanography at Texas A&M University. Mr. Etter served on active duty in the U.S. Navy as an Anti-Submarine Warfare (ASW) Officer aboard frigates. He is the author or co-author of more than 140 technical reports and professional papers addressing environmental measurement technology, underwater acoustics and physical oceanography. Mr. Etter is the author of the textbook Underwater Acoustic Modeling and Simulation. • Introduction. Nature of acoustical measurements and prediction. Modern developments in physical and mathematical modeling. Diagnostic versus prognostic applications. Latest developments in acoustic sensing of the oceans. • The Ocean as an Acoustic Medium. Distribution of physical and chemical properties in the oceans. Sound-speed calculation, measurement and distribution. Surface and bottom boundary conditions. Effects of circulation patterns, fronts, eddy and fine-scale features on acoustics. Biological effects. • Propagation. Observations and Physical Models. Basic concepts, boundary interactions, attenuation and absorption. Shear-wave effects in the sea floor and ice cover. Ducting phenomena including surface ducts, sound channels, convergence zones, shallow-water ducts and Arctic half-channels. Spatial and temporal coherence. Mathematical Models. Theoretical basis for propagation modeling. Frequency-domain wave equation formulations including ray theory, normal mode, multipath expansion, fast field and parabolic approximation techniques. New developments in shallow-water and under-ice models. Domains of applicability. Model summary tables. Data support requirements. Specific examples (PE and RAYMODE). References. Demonstrations. • Noise. Observations and Physical Models. Noise sources and spectra. Depth dependence and directionality. Slope-conversion effects. Mathematical Models. Theoretical basis for noise modeling. Ambient noise and beam-noise statistics models. Pathological features arising from inappropriate assumptions. Model summary tables. Data support requirements. Specific example (RANDI-III). References. • Reverberation. Observations and Physical Models. Volume and boundary scattering. Shallow-water and under-ice reverberation features. Mathematical Models. Theoretical basis for reverberation modeling. Cell scattering and point scattering techniques. Bistatic reverberation formulations and operational restrictions. Data support requirements. Specific examples (REVMOD and Bistatic Acoustic Model). References. • Sonar Performance Models. Sonar equations. Model operating systems. Model summary tables. Data support requirements. Sources of oceanographic and acoustic data. Specific examples (NISSM and Generic Sonar Model). References. • Modeling and Simulation. Review of simulation theory including advanced methodologies and infrastructure tools. Overview of engineering, engagement, mission and theater level models. Discussion of applications in concept evaluation, training and resource allocation. • Modern Applications in Shallow Water and Inverse Acoustic Sensing. Stochastic modeling, broadband and time-domain modeling techniques, matched field processing, acoustic tomography, coupled ocean-acoustic modeling, 3D modeling, and chaotic metrics. • Model Evaluation. Guidelines for model evaluation and documentation. Analytical benchmark solutions. Theoretical and operational limitations. Verification, validation and accreditation. Examples. • Demonstrations and Problem Sessions. Demonstration of PC-based propagation and active sonar models. Hands-on problem sessions and discussion of results.